This amazing polyethylene oxide polymer displays mind-bending, non-Newtonian properties when dissolved with anhydrous alcohol or acetone (not included). Using only a small amount of polymer, you can create a fluid that will climb a rotating rod, or siphon itself into a lower beaker! 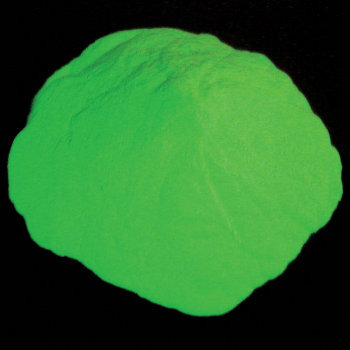 By adding a fluorescent dye during the dissolving process, these demonstrations can be presented in the dark using an ultraviolet light for illumination - a Super! Wow! Neat!® demonstration. This non-toxic polymer is used for thickening cosmetics. This polyethylene oxide polymer has a molecular weight of 4,000,000 amu. Note: anhydrous alcohol, such as denatured alcohol, available in hardware stores, or acetone is needed for the dissolving process. Each demonstration requires only a small amount of polymer. When a small amount of this white powder is sprinkled into a liquid and water is added, it dissolves, forming a thick, mucous-like gel. When the gel is poured back and forth between two beakers, the gel readily siphons from the higher vessel to the lower one. Mix 20-25 ml of a dry alcohol such as anhydrous methanol or ethanol with 3-4 grams of polyethylene oxide in a clean, dry 600 ml beaker. Swirl the mixture to completely wet the resin with alcohol. Add 350-400 ml of tap water into the mixture 'in one pour' and stir until the resin has gelled completely. Pour the gel into a second 600 ml beaker and then back and forth between the two beakers. The polyethylene oxide can be made to siphon by raising one beaker above the other while gradually pouring the gel. Once the gel starts to pull, separate the two beakers and turn the upper vessel upright. The gel will move up the sides of the beaker as a thin film which forms thick strands as it falls. This process can be continued indefinitely. Empty the contents of one of the beakers into the other. Add 100 ml of tap water to the empty beaker and coat its sides with the water by swirling. Pour the gel into the water, then back into the original beaker. The siphoning process speeds up considerately, pulling the gel quickly out of the upper beaker. 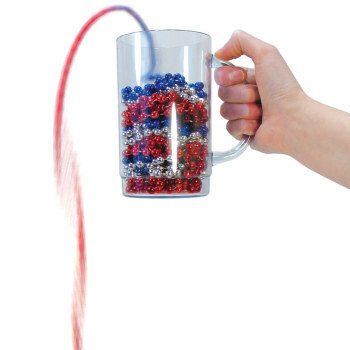 Caution: even small strands can start the siphoning process, emptying the beaker unexpectedly. An interesting variation on this experiment is to add a few crystals of a fluorescent dye such as fluorescein or rhodamine B to the alcohol before adding the polyethylene oxide. The experiment can then be performed in a darkened room if illuminated with a fluorescent light, creating a striking effect. The gel can be disposed of in the waste paper basket (it's 99% water). The glassware can be rinsed with plenty of tap water and dried. The alcohol acts as a dispersant to separate the resin particles inhibiting the formation of large, insoluble lumps. Any water soluble alcohol can be used as long as it is dry. In addition to methanol and ethanol, isopropyl alcohol, ethylene glycol, propylene glycol, and acetone can also be used as a dispersant. Deionized or distilled water is unnecessary since, being nonionic, the polyethylene oxide gel is not affected by the minerals in ordinary tap water. While the polyethylene oxide resin is a fine powder and some dust is released when massing or mixing the resin with alcohol, it has a very low order of toxicity by all means of exposure, according to its manufacturer. Due to its high molecular weight, it is poorly absorbed by the gastrointestinal tract, and is completely and rapidly eliminated. The resin is neither a skin irritant, nor a sensitizer, nor does it cause eye irritation as the dry powder or as aqueous solution. Polyethylene oxide, being a polyether, and containing an oxygen as every third atom in the chain, readily hydrogen bonds with water. This large number of oxygen and their two pairs of nonbonded 'p' electrons explains its high water solubility for its molecular mass (~4,000,000). The long strands of gel are formed when these large molecules intertwine much like spaghetti and are cross-linked by water molecules attached to the oxygen on adjacent molecules. The result is a 'viscoelastic' gel. That is, like molasses, the gel has a high viscosity due to the large number of hydrogen bonds between the polymer molecules and water, and is elastic since these very long molecules can both straighten when stretched and slide past each other, forming fresh hydrogen bonds as they move. 3. Myerly, Richard C., J. Chem. Ed., 57, pp 437-8 (June 1980). I purchased this to try to make bubbles because it said it took a lot less than using J-Lube. I doubted the amount it said to use (1/2 teaspoon for 4 gallons), so I used a full teaspoon for 5 gallons & ended up having to split it into two! I am a believer now! A-1 quality and service. Received item fast and am very happy with the performance of the product. I would highly recommend this vendor. I am currently looking at their catalogue which has a host of great products. I am going to order from them again soon! I blow giant soap bubbles and this stuff is the best. I use it to increase the viscosity of my soap solutions and just a little bit has a profound effect. In 30 gallons of bubble soap solution I use about 3/4 teaspoon and see an immediate and profound viscosity change. 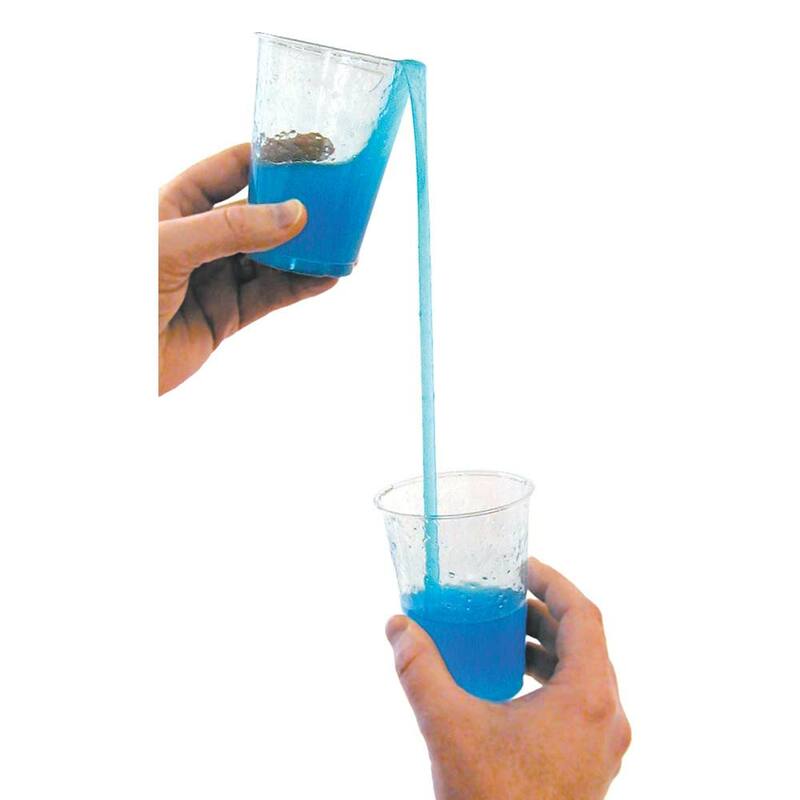 It's the best thing ever for making bubble liquid. I make a slurry of 4gr in 16oz of water (good trick is to mix in a little bicarb and citric acid to 'fizz mix' it) and add about 1oz of that slurry to a gallon of water with 10oz of Dawn Ultra. This makes superb bubble juice for about $1 a gallon. I don't use this for the typical purpose of making a self siphoning slime. It's one of the ingredients in my soap bubble recipe, for making super huge bubbles. This product is far more effective than the previous product I'd been using! where before i had to add 1.75g per gallon, I only need 0.15g of the Teachers source product. also arrived lighting fast! I will definitely be buying my polymer from teachersource.com, from now on.